This was a project of the NCK research theme. The management of reindeer (Rangifer tarandus) is practiced widely throughout, and beyond, the Eurasian north. Within the European north it represents the major land use of the tundra regions, and also extends southwards into the boreal forest. Between the North Sea and the Ural mountains, approximately one million reindeer are managed on an area of roughly 750,000 km2. Although the significance of this activity is not great in the context of the national economies of the four European states (Norway, Sweden, Finland and Russia) involved, reindeer husbandry derives its importance from two other considerations. The first is the sheer scale of its interaction with high-latitude vegetation, and the second is the fact that it is practiced almost exclusively by indigenous communities (in Europe, the Saami, Nenets and Komi peoples) and plays a considerable role in their cultural identity and economic security. It is thus important to consider the potential effect of reindeer grazing in modifying vegetation distribution and shifts. It is also important to assess the likely response and vulnerability of reindeer husbandry to projected changes in global climate. A number of studies have already suggested that reindeer husbandry has at least the potential to be adversely affected by climate change. For these reasons, reindeer husbandry was included within the scope of the EU-funded BALANCE project. 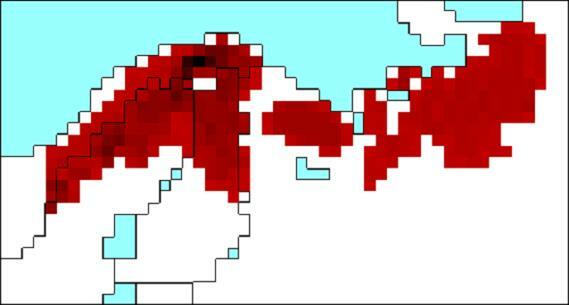 Density of reindeer in northern Europe, gridded to the 50-km resolution of the BALANCE project. 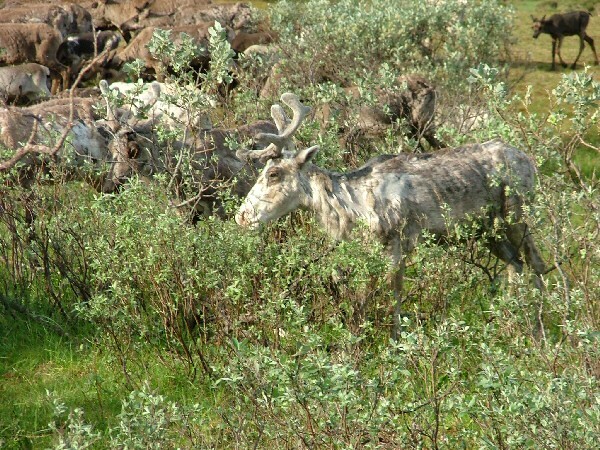 Reindeer interacting with biomass, Nenets Autonomous Okrug, Russia, July 2004. Photo: Gareth Rees. Located mostly beyond the northern limits of agriculture and highly adapted to cold conditions, reindeer are basic to human life in many areas of the Eurasian North. The management systems for domestic reindeer broadly imitate earlier movements of wild reindeer, in which herds migrate in an annual cycle in search of seasonal vegetation. Management by humans is therefore based on assessments of quality, location and timing of pasture. Reindeer must graze sufficiently on green plants in the summer in order to survive the winter. In winter, they dig through snow to reach lichens, the accessibility of which is a severe limiting factor. Conspicuous environmental vulnerabilities therefore include heat and harassment by biting insects in summer, and covering of pastures by ice and deep snow in winter. Although in large regions of the Arctic (Alaska, Chukotka, Taimyr) wild reindeer / caribou have been increasing in the last decade, in Europe domestic reindeer heavily outnumber their wild counterparts. Since domestic reindeer are managed by (mostly indigenous) people, it is clearly not possible to consider interactions between reindeer, vegetation and climate separately from the socioeconomic and political environment within which the reindeer are managed. This environment is not uniform across our study area, and is not static. 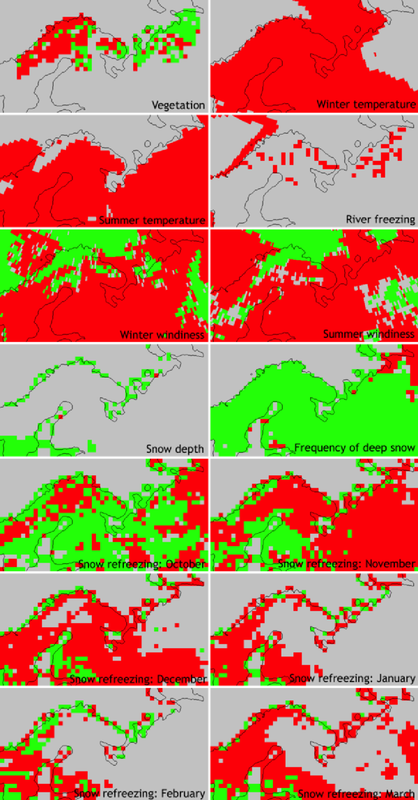 The most obvious relevant change in recent history was the unexpected transformation in the political system from the Soviet Union to the Russian Federation, which not only brought radical changes in reindeer herding in the Russian part of the Barents region, but also had significant impacts on reindeer herding in Fennoscandia. The consequences of this change have still not been fully worked through. Many of the institutional structures of the Soviet era are still in place, and are often considered to be part of the 'traditional' practice of reindeer husbandry. 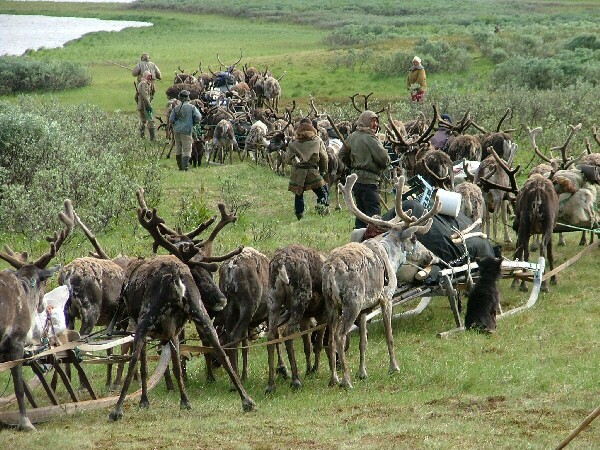 Although the other three reindeer-herding countries have not experienced political upheavals comparable to the dismantling of the Soviet Union, continued change in the socioeconomic environment of reindeer husbandry is occurring throughout the region. The aim of this work is thus to consider the likely response of the practice of reindeer husbandry to climate change and to changes in the socioeconomic and political setting, taking the same timescale (to 2080) as the BALANCE project as a whole, and allowing for regional differences. This is not a straightforward task. The key concept is that of vulnerability, which we interpret, following the approach of the Intergovernmental Panel on Climate Change, as potential impact offset by adaptive capacity. For the natural environment, potential impact can be quantified to some extent although a number of factors can not currently be included in our analysis. A quantitative approach is more difficult in the case of socioeconomic and political impacts, and the concept of a 'vulnerability indicator' is controversial. However, we have attempted to identify the principal risks to which reindeer husbandry is subject, and to compare their magnitude. 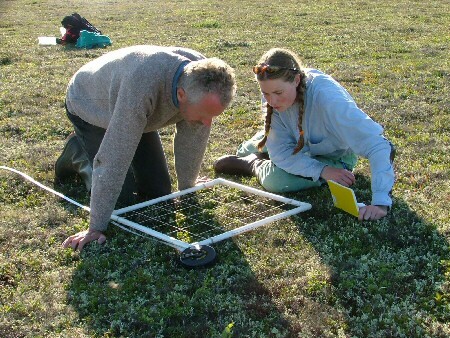 Our data are synthesised from a wide range of sources, including inputs from several of the participating teams within the BALANCE project as well as combined natural- and social- science field research in the Nenets Autonomous Okrug (NAO), Russia. 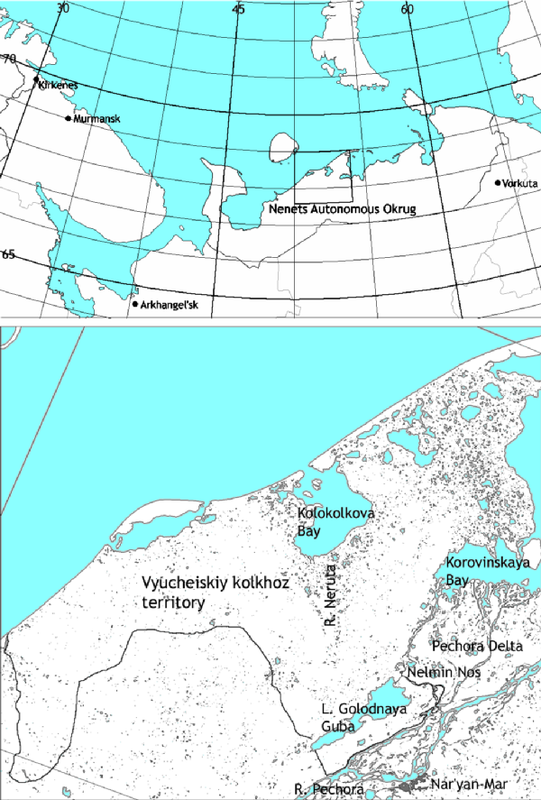 Location of the detailed study area within the Nenets Autonomous Okrug, Russia. Collecting botanical data at the most detailed level. Photo: Gareth Rees. Classification of the study site from Landsat satellite image. 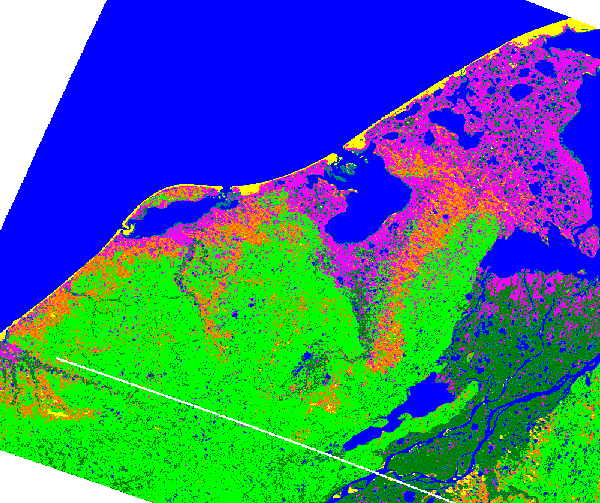 Green = moist heath tundra; orange = dry heath tundra; dark green = riparian willow thicket; purple = wetland; yellow = bare ground. Predicted change in potential impact, present day to 2080, for a range of environmental factors. 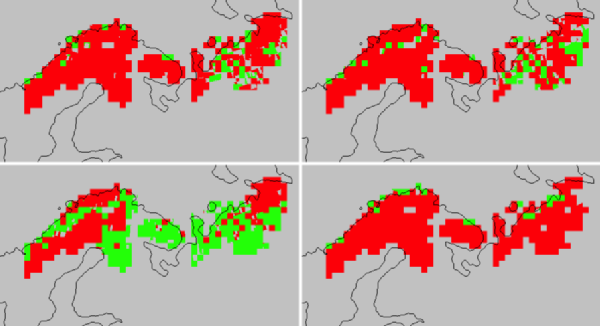 Green denotes increasing favourability for reindeer, red denotes decreasing favourability. Combination of all environmental factors to show the general trend in suitability of areas for reindeer grazing, present day to 2080. The four figures show four different relative weights applied to the environmental factors. Environmental pressures on reindeer husbandry in the European North, driven by projected climate change to the year 2080, are predicted to be generally negative in Scandinavia, neutral in Finland and mildly positive in Russia, largely through a combination of changing vegetation distribution, winter temperature and wind regime. The predicted effects of these pressures are comparatively small, with considerable scope for mitigation, and within the range of experience of reindeer herders. We therefore conclude that the vulnerability of reindeer husbandry to climate change is low. On the other hand, the potential impacts from changes to the subsidy regime and to loss of pasture through industrialisation, pollution, forestry, farming etc. are large. Furthermore, socioeconomic changes have the potential to act in synergy with climate change, thereby further increasing the possible impacts. The adaptive capacity to cope with such changes, and hence the vulnerability to them, varies considerably across the Barents region. We plan to develop this work in the future, by extending the case study to other areas and by improving the modelling of environmental impacts. In particular, we hope to include a representation of the current and predicted distributions of lichens, and to calibrate the snow refreezing index against data obtained from herders. We also intend to analyse ways in which herders' changing perceptions of land and weather, paired with memory and prediction, influence decisions about reindeer grazing and may thereby modify the influence of natural factors.